Precision Lawn Chair Demonstration Team performs during the Vail America Days on Wednesday, July 4, in Vail. 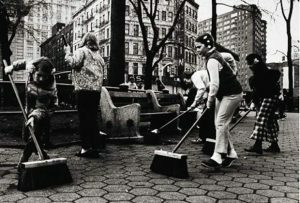 The annual tradition is revered by many as they proceed down their route. 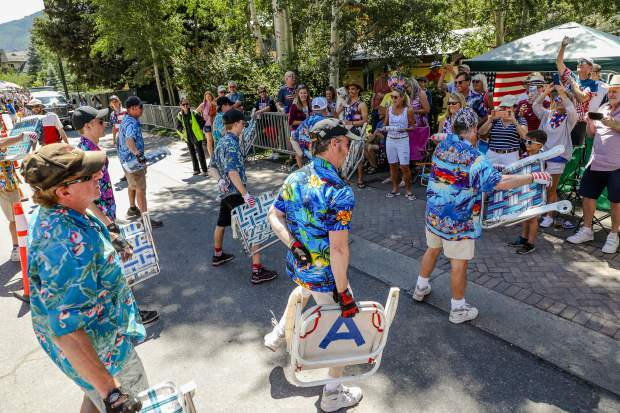 VAIL ­— Attendees at the annual Vail America Days parade ranged in age from 0 to 96. Several members of the 90 club were present for the Wednesday, July 4, parade, which featured a cross-section of community members and celebrated local World War II veterans such as Edwards resident Donald Dekoster, age 96, who also served in the Korean War. Also present were World War II veterans Bernard Gottlieb, who is 90 and lives in East Vail, and Wales Madden, 91. Madden is from Texas and also has a home in Vail. He has been visiting since the first year Vail Mountain opened, in the 1962-63 season. Leading the World War II vets in the Vail America Days parade was a current member of the U.S. Army’s 10th Mountain Division, Eagle Valley High School Class of 2016 graduate Lane Dobransky. Lane Dobransky is from Dotsero, where the 19-year-old lives with his family, who also participated in the parade. Lane Dobransky said it was a dream come true to join the U.S. Army and be assigned to the 10th Mountain Division. The 10th Mountain Division traces its history back to the early 1940s in nearby Camp Hale, where troops were trained in winter warfare before being sent off to fight in the mountains of Italy. These days, 10th Mountain Division members are stationed in different places throughout the U.S.; Lane Dobransky spends much of his time at the Army’s installation in Fort Polk, Louisiana. In May, he returned to the U.S. after spending nine months in Iraq. His mother, Beth Dobransky, said she has been sleeping easier since her son returned home. Not long after that, Lane Dobransky was on his way to Iraq. The Dobransky family was joined by Lane Dobransky’s aunt and uncle, Jill and Chris Dobransky, along with their children, 10-year-old Max, 9-year-old Noah and 1-year-old Iris. The family came in from Strasburg to participate in the parade and marched with Beth Dobransky and the Junior Livestock Sales Commission. Lane Dobransky heads back to Fort Polk on Saturday, July 7. Buddy Sims, who helped organize the veterans march at the Vail America Days parade, said they were lucky to have Dobransky hold the flag in their procession on Wednesday. “He’s not in town for long,” Sims said. Sims is a veteran of the Vietnam War who was joined by several other Vietnam War veterans at the parade; Korean War veterans Allan Nottingham, Larry Trotter, Jim Kleckner and Fred Distelhorst were also in attendance. The veterans were transported in original World War II vehicles, including an original 1947 Willys Jeep, and a 1946 Jeep CJ-2 Willys. In what is now becoming a Vail America Days tradition, one of the vehicles broke down and had to be pushed part of the way. This year it was the 1946 Jeep CJ-2 Willys, which belonged to Battle Mountain graduate John Shaw Vaughan, a lieutenant with the Army who was killed in Iraq in 2006. Vaughan built the Jeep in 2000 before heading to Iraq, his mother Sarah Vaughan has maintained it since then. “We think it wasn’t starting due to an electrical problem,” Sarah Vaughan said of the ’46 Willys. The problem was no problem, said Sims, who found some volunteers from the Civil Air Patrol to help push the vehicle. Like many things in Vail, the fun times were also a bit of a friendly competition at the Vail America Days parade. Returning to the competition after several years off, Vail Resorts made a big splash with its Mount of the Holy Cross paper mache tribute, winning best float. Longtime Vail Resorts employee Brandy Faven headed up the effort. “I just saw it in my head,” she said of the float. 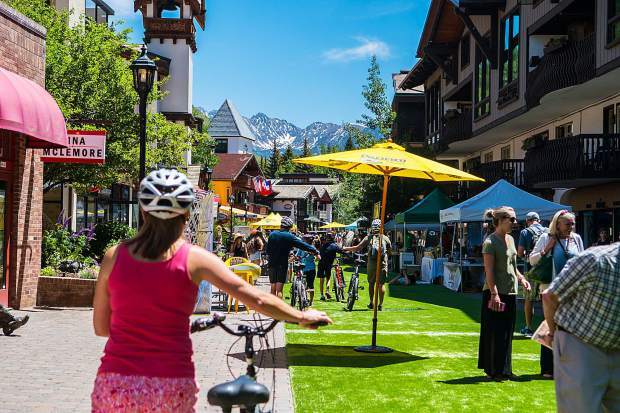 Under a large depiction of the Mount of the Holy Cross, Eagle County’s only 14,000-foot peak, the float featured figurines hiking, camping, bird watching, riding a zip line, kayaking and enjoying the outdoors. Faven said she used to help design parade floats for Vail Resorts years ago, but hadn’t been involved in recent years after longtime float designer Bobbi Titter moved on from the job. Thinking back to those days, “we wanted to get serious again,” Faven said. Faven said eight volunteers put in 100 hours or so designing this year’s float. “It was a beautiful float, I’m so happy with the way it turned out,” she said. Most Distinctive: The Boston Consulting Group parade float was designed by the families based in BCG’s Colorado office, which is celebrating its second anniversary. Its glittery mountain landscape perfectly framed kids of all ages enjoying Vail and its great outdoors. Most Original: Wild West Days’ float S’More Fun in the Great Outdoors was certainly most original with oversized marshmallows, Graham crackers and Hersey’s Chocolate bars lining the float’s perimeter. Join them for Wild West Days, a 25-year-old tradition to help raise funds for Vail’s Elementary Schools at 4 Eagle Ranch, Sept. 30. Best in Show​: All the talented young artists who participated in the Alpine Arts Center kids’ art camps designed this year’s parade float. They worked together on this Alpine Arts Center Goes Camping design. From deer sculptures and campfires to costumes representing hikers, bikers, Colorado wildlife and more, everything is handmade to represent some of the kids favorite parts of Colorado and America’s great outdoors. 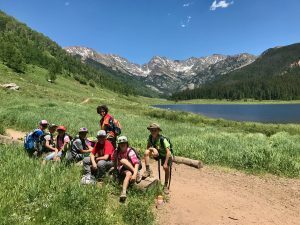 ​Best Youth: Longtime Vail America Days partner, the Gallegos Corp., teamed up with Roundup River Ranch to bring kids with serious illnesses to America’s Great Outdoors. The float recreated the fishing pond that the Gallegos Corp. built at Roundup River Ranch for these children to enjoy, free of charge. ​Best Motorized​: Driving a classic car the 1927 Graham Bros. truck in patriotic red won for best motorized entry. The Vail Valley Jet Center is proud to support private aviation travel into the Rocky Mountains, helping guest arrive and enjoy America’s great outdoors. Best Marching/Musical: Alpine Bank and Vail Jazz presented My Favorite Things’ Celebrating America’s Original Art Form: Jazz. 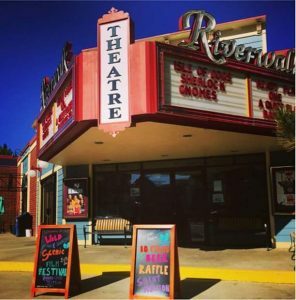 Alpine Bank celebrates its 45th anniversary of trailblazing in the Vail Valley and The Vail Jazz Foundation is a local nonprofit presenting over 70 performances this summer.